A caring person who is passionate about her work with children. Candace Carriger is the engine that powers The Dance Lab, a creative arts space designed to encourage self-expression, self-discovery, creative explorations, risk-taking, mindfulness, sharing, and self-development. Carriger’s openhearted energy fills the space creating a wonderful environment for children and families, allowing children to feel comfortable no matter their individual learning style, energy levels, and independent spirit. Carriger approaches dance as an expressive art, featuring each experience that is shared as valuable knowledge for the students. Her process-oriented programs are designed to encourage positive creative learning through open-ended structures, constructive guidance and lots of personal encouragement. “Working in this creative way offers children a voice that is not always considered in traditional dance classes,” says Carriger. Correspondingly, as a child-centered program, the students are encouraged to bring forward ideas and suggestions about their own learning experience because Carriger recognizes the fundamental value of giving children ownership of their thoughts, and accomplishments through class participation. “The Dance Lab is not your typical neighborhood dance school. We are so much more than just dance. And, we teach much more than just steps,” says Carriger. The Dance Lab’s curriculum is continuously evolving around the interest of the students and community. Carriger gets inspirations for The Dance Lab’s classes from nature, artwork, music, and the world around us. She is adamant to never use commercialized themes. Carriger offers a wide range of creative dance classes, starting from age 4 and up. 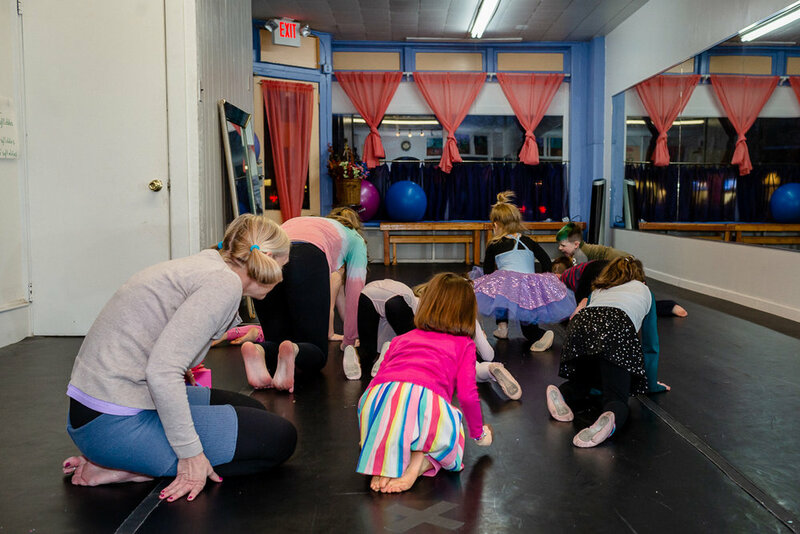 In addition to creative dance, she also offers a variety of workshops, parties, events for children / families, homeschool groups, and private lessons. A very important aspect of their environment is that children are encouraged to work in groups of mixed ages for a more dynamic learning experience where knowledge gets passed down to the next generation or vise versa the older kids learn from the younger ones. “Outside My Window was designed, created, and published as an inspiration for our dance and literacy program at The Dance Lab. Rhyming text and vivid illustrations inspire creative thinking and creative dance. Similarly, Inside My Garden is also designed to promote literacy and creativity. Bravo Bennett highlights diversity, friendship, and the acceptability for boys dance. We utilize all three children’s books in our creative dance and art programs. Outside My Window has been shared with hundreds of children throughout local libraries and the community as part of Story Dance, a Dance Lab original offering!” says Carriger. Carriger’s Dance Lab is in Moorestown, South New Jersey. The studio’s personal touches create a friendly ambiance. For instance, the walls paintings are by a NYC artist, who was able to capture the emotions and movements of some of the previous students in action. Carriger uses incense and oils to intensify a calming or brightening energy in the space as well as soothing music. The studio has cubbies, stools, chairs, benches, and a table that are all kid-sized. There is a waiting area that is quiet and cozy for parents and siblings, and next to it, a kitchen space where they share snacks, art, and hang-out space. Moreover, there is no physical doorway separating the waiting areas from the studio space, allowing families to watch and listen during classes. When you enter the studio space itself, there is a selection of colorful, and fun types of props to be used by the students for inspiration and more creative experiences. Lastly, there is a professional dance floor, wall of mirrors, dance barres, an eclectic selection of music, a wide variety of musical instruments, yoga mats, and so much more. “It is truly a magical space,” says Carriger. 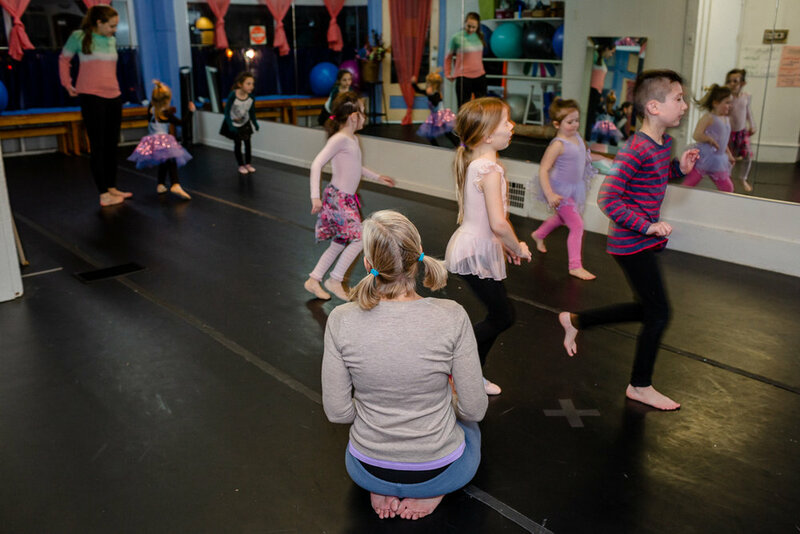 “Children that attend classes at The Dance Lab benefit from our creative approach. While the world around us places a great value on athletic competition and academic achievement for children, we believe creative opportunities are equally valuable to growing the whole child,” says Carriger. 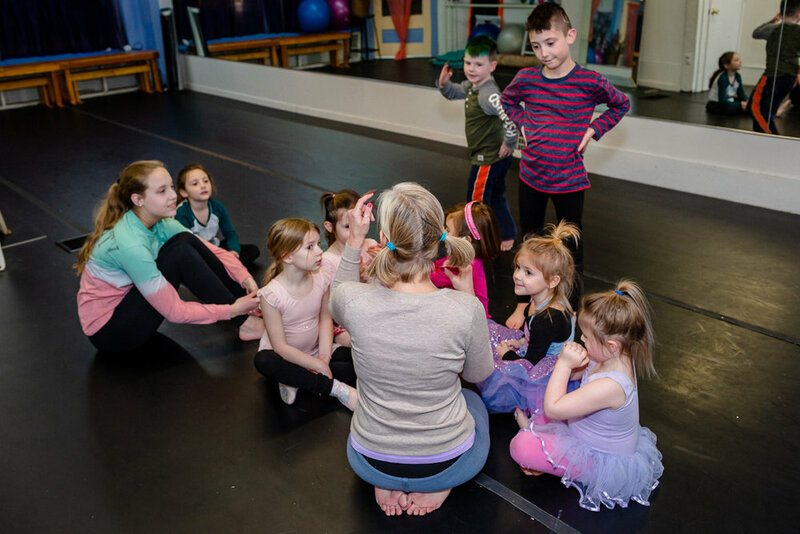 According to Carriger, through dance/body movement children gain a deeper understanding of who they are, how they move, think, create, and express themselves. Carriger encourages her students to simultaneously think as they move, a recipe for creativity and exploration. Moreover, students are encouraged to move beyond their comfort zones without judgement or negative consequences. As a result, children become risk-takers in their creative development without even realizing, allowing them to gain a stronger body-mind-spirit connectivity. Carriger also says that these benefits hold true for Yoga, creative writing, and art classes as well. Another benefit from encouraging children’s uniqueness and individuality to shine bright is that they develop a stronger self-image. The classes’ structures are based on the student utilizing critical thinking skills. Other benefits include enhanced focus, increased fine and gross motor skills, improved social skills, as well as, a greater sense of kindness and caring towards self and others. “It is our hope that the work we do in the studio seeps into the real world. When children are encouraged to have a voice of their own and begin to understand more greatly the value of risk-taking, expressing themselves creatively, and becoming more self-aware, we believe these values will carry forward with children wherever their life path takes them. That is a valuable benefit of time spent at The Dance Lab” says Carriger. 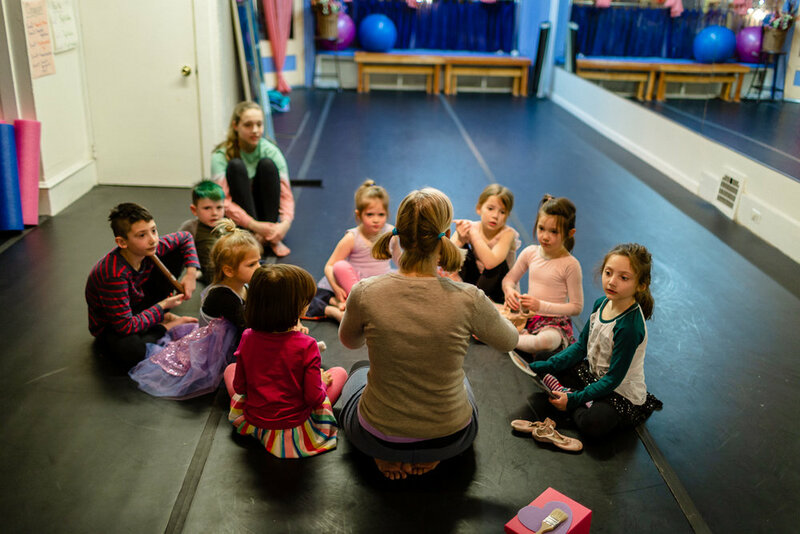 Carriger’s Dance Lab brings a unique opportunity to the community for children and their families because they offer a program that emphasizes individuality, personal growth, artistic development, and creative understanding. Carriger offers a positive learning environment where children can flourish and grow creatively, aesthetically, and physically. “Some children have been told they will never be a dancer, but still love to move and dance. Some children are not as comfortable with sports, but still want to be active. Some children have been told they are not artistic, but still love to paint and make art. Some children struggle with writing skills, but still love to make up their stories. Some children think they are not flexible, but still love to stretch and move. All of these examples confirm to us that The Dance Lab is of great value to our community. We encourage children to ignore those negative ideas, and just try one of our classes. With gentle guidance, positive feedback, and structures designed to expand skills and self-discovery, children begin to realize they are capable of so much more than they ever imagined,” says Carriger. Along with typically developing and gifted and talented students, Carriger also works with a wide range of children with physical, emotional, and/or developmental special needs. She has worked with children who deal with Asperger Syndrome, ADD, ADHD, Low Tone, Nonverbal Language Disorder, Selective Mutism, Social Anxiety, Speech Delays, Learning Delays, Developmental Delays, Sensory Processing Disorder, as well as children who are on the Autism Spectrum, and more. In addition, she communicates with speech therapists, physical therapists, and occupational therapists in the community, when appropriate, to help better design individual growth and development plans for specific children. “We have developed a philosophy and persevered with our beliefs because we are highly confident in the value of our approach to sharing the arts with the next generation,” says Carriger. Carriger has shared creative experiences with children in and around the community. She introduced, designed, and created dance programs for several preschools, some that are still going strong today. 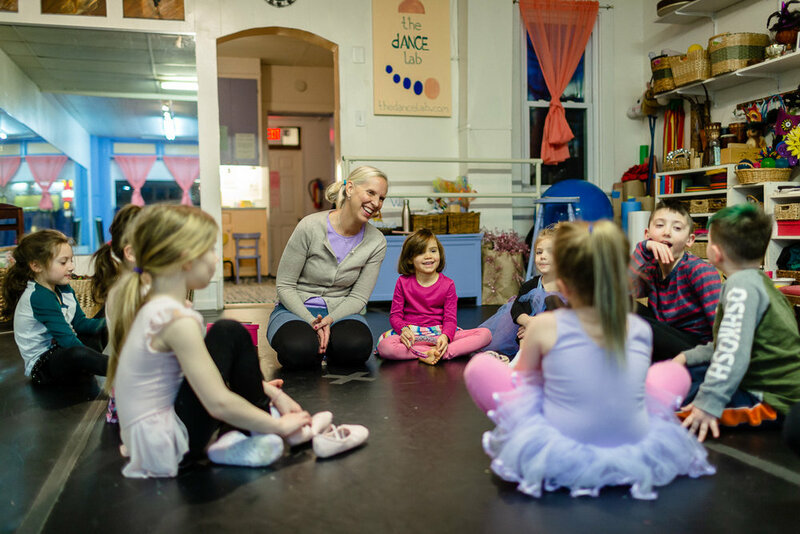 She has brought creative dance to many local community-based programs and arts organizations throughout Moorestown and the surrounding areas. 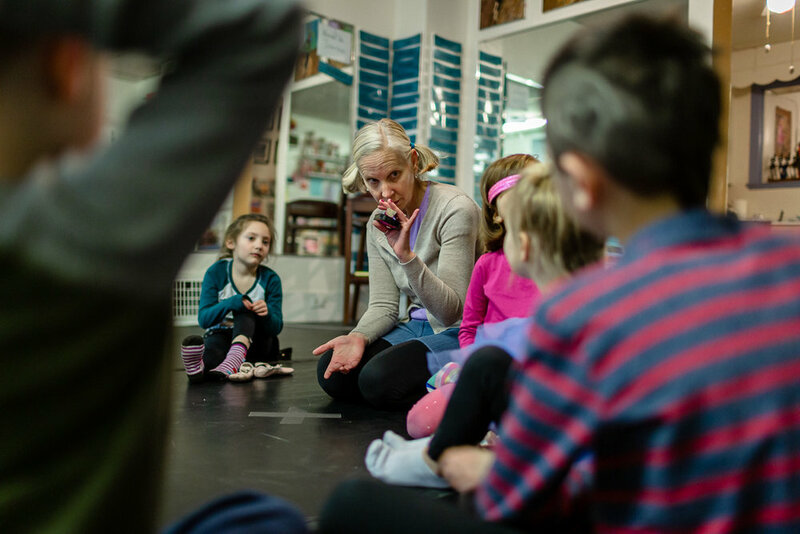 She has presented teacher trainings to classroom teachers, offering ideas, structures, and strategies for incorporating creative dance into their story times and literacy lesson plans. Also, she has collaborated with local musicians and talented artists to bring the arts to the community. She has presented student-created dance works to events at the Community House. She has presented Pilates to high school kids at the Moorestown High School. And, has shared creative programming at private parties and events throughout the community. 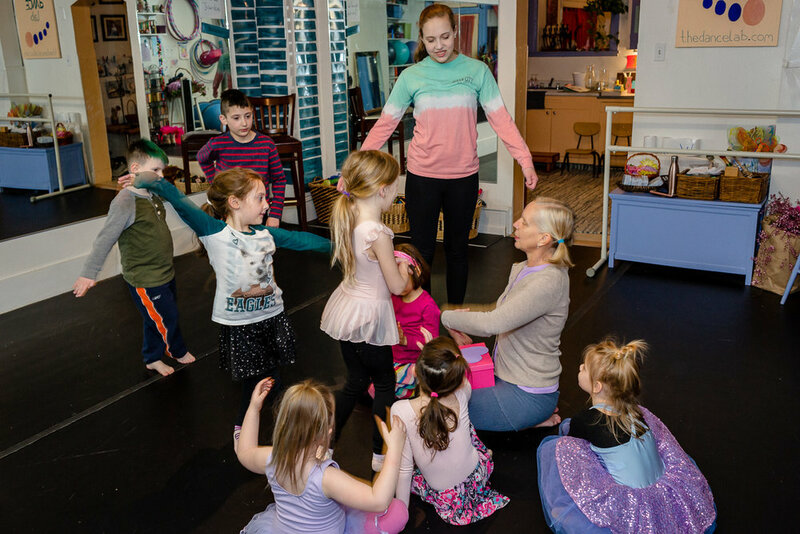 “Collaborating with other artists, musicians, teachers, and arts programs for the benefit of sharing the arts with children throughout the community continues to motivate our own growth and development at The Dance Lab,” says Carriger. Fall 2019 marks The Dance Lab’s 10th year in its current studio location. For this reason, Carriger would like to explore producing a children’s book about experiences at The Dance Lab, as a collaborative venture with her students. “In the next five years, we are developing a teacher training certificate program that will allow us to share our philosophies, structures, and approach to dance and arts education. An educational book, sharing examples of lesson ideas, teaching strategies, children’s antidotes, and more, is scheduled to be completed in the next few years,” says Carriger. Carriger is planning a traveling artist program which will allow other communities to gain access to The Dance Lab program. Also, she is interested in creating a children’s improvisational dance group, so that her students can share more of their work around the community. Ultimately, she hopes to connect with more children, families, teachers, and artists beyond our immediate community. “Some of our friends like to ask us, “What are you cooking up in the Lab this week?” Well, we are always busy, always developing, always growing, and always creating. Some of our students tell us we should be called “The Fun Lab” because we are always having fun at the studio. We are constantly inspired by our students and we hope to continue to be a positive influence on our community and inspire all those who take part in The Dance Lab offerings,” says Carriger.